As pastry aficionados across the nation know, the famed original Wonuts remain locked away in a Chicago cafe. But some quick detective work by Stephanie Le at i am a food blog reveals that not only are waffled donuts super easy to recreate in your kitchen -- they're even delicious with sad supermarket donuts. 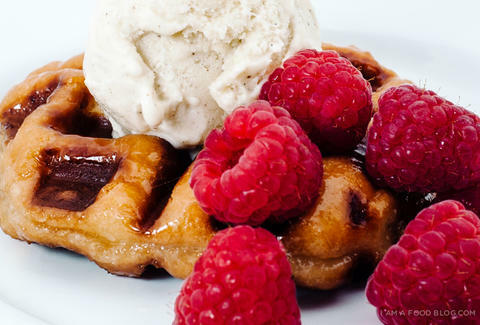 In an attempt to redeem an ill-advised grocery store buy, Le pressed some stale glazed donuts in her waffle iron, and, after topping them with vanilla ice cream and raspberries, discovered she had a Liège waffle-like masterpiece on her hands. No need to whip up some waffle or cake donut batter from scratch. You can seriously just throw any old glazed donut in your iron and call it a day... and you probably should, because eating a dozen of these things is exhausting. Kristin Hunt is a food/drink staff writer for Thrillist, and is relieved to know grocery store donuts are good for something. Follow her at @kristin_hunt.